Beer Recipe Design on the Go? 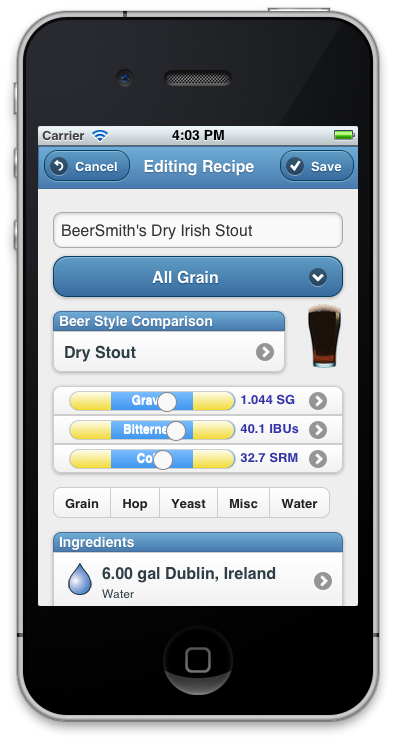 I’m pleased to announce the release of BeerSmith Mobile for iPhone and iPad. 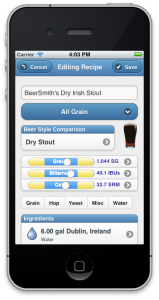 BeerSmith Mobile brings full recipe design and editing to your iPhone or iPad, and joins last week’s versions released for Android and Kindle Fire. BeerSmith mobile includes seamless recipe integration via the BeerSmithRecipes.com cloud site so you can drop a recipe in your cloud folder on your desktop, and edit it from your phone or tablet on the go! Watch this video of BeerSmith Mobile in action! BeerSmith mobile gives you the ability to fully edit recipes, equipment profiles, mash profiles, ingredients as well as a full brewday recipe timer. BeerSmith Mobile is available at a sale price of $7.99 (20% off) until the end of June. After that the price will be raised to its normal level of $9.99. It is available now for iPhone, iPad, Android phones and tablets and the Kindle Fire. I would say it has almost about 85% of the recipe functionality of the desktop version, with the yeast starter tool being the obvious exception. The mobile version does not have many of the other tools like the calendar and inventory tracking however. But if you want to create, edit and brew recipes the mobile version has what you need. Will you be adding the yeast starter tool to the mobile version? How do I print the brew day notes like I can from the desk top version on the new mobile version? Sorry – I don’t have printing enabled yet, but just about everything that is on the brewday printout is on the timer page if you open any recipe and click on timer. I actually did a cross comparison when building that page for brewing. Yes – it is high on my list for an early update. I set the price at $7.99 US, but the app store translates that price for each country based on their own conversion and cost structure for that country. Unfortunately I can’t set the price outside the US – for the most part it is set automatically based on the US price. Any easy way to get the 1.4 grain extensions into the mobile version of the app when I don’t own the desktop version? I’ve been looking forward to this. I wanted to take advantage of the “in-app” iPhone upgrade you’ve mentioned. I now see on my BeerSmith Lite an upgrade option to “Purchase Upgrade” to add recipe editing, but when I try to use it, the “Confirm … Purchase” pop-up says [Environment: Sandbox] and when I try to buy it with my iTunes account, another pop-up tells me “This is not a Test User account… please create a new account in the Sandbox environment”. I’m completely sandboxed. Should I just continue to wait, or is this a problem that should be fixed? Thanks for a great product that allows free artistic expression in the science of brewing, with the kind of feedback that helps to prevent the undrinkable. Is there a way to email a recipe from a mobile device?? Any updates on även the inventory will be implemented? discounts in either app store. I do apologize…I just have no way within the constraints of the app stores to transfer the license. Does the mobile app have the ability to convert an all grain recipe to extract? Or is that only a feature of the desktop version? A few suggestions to the mobile version: 1. A possibility to email recipes. 2. Dropbox support or similar, with an offline copy of all the synced recipes. 3. Auto conversion of recipes from US to metric & vice cersa, when the settings are changed. It’s something that already exists in other beer apps and would be lovely to see in Beersmith too. Mobile app would be much better with Inventory and Shopping List. (And Yeast starter tool). Will you be adding these features? IOS9 will not allow saving or editing to the cloud. Yes – Apple released the 9.0.1 update without sending it to developers and it broke many of the fixes I put in place for IOS9. I implemented fixes for this in one day but it will take several days to get it through the Apple review process and get them to you. You should get an update to the app correcting the issue within the next week. – The ability to see alternative ingredients with the click of a button. Seems like the supply store is always missing at least one of the ingredients and a simple way to find the alternative ingredient would be very handy. I’ve been using Beersmith for a few years now and really like it. I would like to be able to print my recipes out if possible. Also, if I install the app on my phone and my ipad, can I see the same recipe list on the cloud recipes? Anything you copy to your cloud account (which is private by default) will show up at BeerSmithRecipes.com if you log in there. You can do a basic printout from there. I believe pellet hops are about 10% more effective, but BeerSmith uses pellet hops as the standard addition. How do I share one purchase of beersmith mobile between an iPad and iPhone? If they are tied to the same iTunes account you can install it on both devices after purchase. The license is tied to your iTunes account. Can this integrate/sync with the desk version? I use the desktop version but the portability of the iPad is better on brew days.